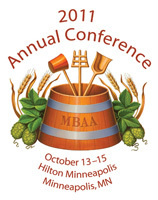 These proceedings contain nearly all of the posters and oral presentations from the 2011 MBAA Annual Conference in Minneapolis, Minnesota on October 13-15, 2011. Posters can be magnified to focus on specific figures, images, tables, and graphs. Oral presentations include the author's full slide show complete with graphics. To access presentations, click on the contents tab. All presentation abstracts are open access, but you must purchase access to view the full presentation or poster. The presentation files are compressed for web delivery but with attention given to the fidelity of the images therein. Please be patient, presentations may take a few moments to open. Interested in the recorded presentations? Not an MBAA member? 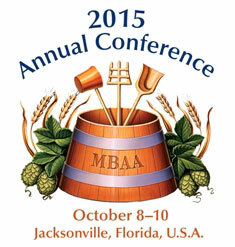 Join MBAA first, then you receive the 2011 proceedings at no charge. O-1. A new look at cleaning draft beer systems: The problems, the solution, and the long way to implementation. Presenter: Dirk Loeffler, Loeffler Chemical Corporation, Atlanta, GA.
O-2. Saving water in the CIP process in the brewing process—A comparison of available technologies. Presenter: Mark Murphy, Butterworth, Inc., Houston, TX. O-3. Troubleshooting microbiological quality issues in cellar operations. Presenter: Joseph Dirksen, Ecolab, St. Paul, MN. O-4. Behavior of hydrogen sulfide during late-stage fermentation. Presenter: Yutaka Yamaguchi, Suntory Liquors Limited, Japan. Coauthor(s): Taichi Maruhashi, Takuya Hashimoto, Kaneo Oka, and Nobuyuki Fukui, Suntory Liquors Limited, Japan. O-5. Metabolism of flavor compounds in Brettanomyces bruxellensis during secondary fermentations at varying pH. Presenter: Andrew Sandstrom, Colorado State University, Fort Collins, CO. Coauthor(s): Chad Yakobson, Crooked Stave Artisan Beer Project, Fort Collins, CO; Pat Murfin, New Belgium Brewing Company, Fort Collins, CO; Jack Avens, Corey Broekling, and Matthew Lewis, Colorado State University, Fort Collins, CO.
O-6. Pure culture fermentation characteristics of Brettanomyces yeast species and their use in the brewing industry. Presenter: Chad Yakobson, Crooked Stave Artisan Beer Project, Denver, CO.
O-7. The different outcomes of bottle conditioning—How to choose the right yeast and parameters for the job. Presenter: Sylvie Van Zandycke, Lallemand Brewing, Milwaukee, WI. Coauthor(s): Tobias Fischborn, Lallemand R&D, Montreal, QC, Canada. O-8. About the influence of the false bottom on the lautering process in a lauter tun. Presenter: Simon Henke, Technical University Munich, Chair of Process Engineering of Disperse Systems, Germany. Coauthor(s): Jakob Aps, Johannes Tippmann, Jens Voigt, and Karl Sommer, Technical University Munich, Chair of Process Engineering of Disperse Systems, Germany. O-9. Applications of new analysis methods for the procedural characterization of mash. Presenter: Johannes Tippmann, Technische Universität München-Weihenstephan, Chair of Process Engineering of Disperse Systems, Freising, Germany. Coauthor(s): Jens Voigt and Karl Sommer, Technische Universität München-Weihenstephan, Chair of Process Engineering of Disperse Systems, Freising, Germany. O-10. The effect of vibrations on barley malt and apple juice mashing. Presenter: Martin Zarnkow, Technische Universität München-Weihenstephan, Freising, Germany. Coauthor(s): Thomas Aldinger and Thomas Becker, Technische Universität München Weihenstephan, Freising, Germany. O-11. Whole grain conditioning—Alternative method to increase brewhouse performance. Presenter: Jens Voigt, Technische Universität München-Weihenstephan, Process Technology, Research and Development, Ludwigsburg, Germany. O-12. Effects of long dry steeping and high-temperature germination on selected quality parameters of malt. Presenter: Fuminori Katono, Kanbaku Company Limited, Tochigi, Japan. Coauthor(s): Tetsuya Arita, Suntory Liquors Limited, Tokyo, Japan; Hitoshi Matsubara, Suntory Business Expert Limited, Tokyo, Japan; Nobuyuki Fukui, Suntory Liquors Limited, Tokyo, Japan. O-13. Malting process optimization of barley (Hordeum vulgare L.) to reduce the content of initiators and maximize the content of inhibitors of sunstruck flavor. Presenter: Alicia Muñoz Insa, TUMünchen, Lehrstuhl für Brau- und Getränketechnologie, Freising, Germany. Coauthor(s): Martina Gastl, TUMünchen, Lehrstuhl für Brau- und Getränketechnologie, Freising, Germany; Thomas Becker, Technische Universität München Weihenstephan, Freising, Germany. O-14. Wheat beer—Possibilities to influence the character. Presenter: Gerrit Bluemelhuber, Doemens Academy GmbH, Graefelfing, Germany. Coauthor(s): Bertram Sacher, Doemens Academy GmbH, Graefelfing, Germany. O-15. Antioxidant activity and polyphenol content of special types of beer. Presenter: Sasa Despotovic, Faculty of Agriculture, University of Belgrade, Belgrade, Serbia. Coauthor(s): Ida Leskosek-Cukalovic, Mile Veljovic, Miomir Niksic, and Viktor Nedovic, Faculty of Agriculture, University of Belgrade, Belgrade, Serbia. O-16. Beer is good for you: Reality or oxymoron? Presenter: Charles Bamforth, Department of Food Science and Technology, University of California, Davis, CA. O-17. Reduction potential of fermentable and unfermentable sugars in beverages and the brewing process. Presenter: Thomas Kunz, Berlin Institute of Technology, Department of Biotechnology, Chair of Brewing Science, Berlin, Germany. Coauthor(s): Eon-Jeong Lee, Torsten Seewald, Victoria Schiwek, and Frank-Jürgen Methner, Berlin Institute of Technology, Department of Biotechnology, Chair of Brewing Science, Berlin, Germany. O-18. Serial repitching: Does yeast generation number matter? Presenter: Katherine Smart, University of Nottingham, Loughborough, U.K.
O-19. Improvement of the oxidative and colloidal stability of beer by use of alternative filter aids. Presenter: Frank-Juergen Methner, Berlin Institute of Technology, Institute of Biotechnology, Chair of Brewing Sciences, Berlin, Germany. Coauthor(s): Thomas Kunz, Berlin Institute of Technology, Institute of Biotechnology, Chair of Brewing Sciences, Berlin, Germany. O-20. Tracing current developments in beer filtration and stabilization. Presenter: Roland Folz, VLB-Berlin, Germany. O-21. Biogas from spent grains—State-of-the-art technology. Presenter: Jens Voigt, Technische Universität München, Center of Life Sciences, Weihenstephan, Germany. O-22. Energy conservation in craft breweries across three orders of magnitude. Presenter: Jaime Jurado, The Gambrinus Company. O-23. Initiatives to restrict carbon dioxide emissions by Asahi Breweries. Presenter: Yoshinori Ito, Asahi Breweries, Ltd., Ibaraki Brewery, Japan. O-24. Managing peak energy with smart grid controls. Presenter: James Spencer, New Belgium Brewing Co..
O-25. A survey on positive results from microbiology analyses—Do we have the fast detection methods we need? Presenter: Gudrun Vogeser, PIKA Weihenstephan GmbH, Pfaffenhofen/Ilm, Germany. Presenter: Alastair Pringle, Pringle-Scott LLC. Presenter: Peter Bouckaert, New Belgium Brewing Co., Fort Collins, CO.
O-28. What yeast has taught me about brewing over the years. O-29. Influence of harvest date on the chemical composition of Willamette and Cascade hops. Presenter: Daniel Sharp, Oregon State University, Corvallis, OR. Coauthor(s): Shaun Townsend, Yanping Qian, and Thomas Shellhammer, Oregon State University, Corvallis, OR. O-30. Innovative hop management to improve oxidative beer stability. Presenter: Philip Wietstock, Berlin Institute of Technology, Department of Biotechnology, Chair of Brewing Sciences, Berlin, Germany. Coauthor(s): Thomas Kunz, Jakob Frenzel, Wiebke Hense, and Frank-Jürgen Methner, Berlin Institute of Technology, Department of Biotechnology, Chair of Brewing Sciences, Berlin, Germany. O-31. Percent co-humulone in hops: Effect on bitterness, utilization rate, foam enhancement and rate of beer staling. Presenter: Val Peacock, Hop Solutions Inc., Edwardsville, IL. O-32. A comparison of flash and tunnel pasteurization technologies used for brewery packaging applications. Presenter: J. David Duff, FleetwoodGoldcoWyard, Romeoville, IL. O-33. Draught line quality standards review and implementation program. Presenter: Jeffrey Schaefer, New Glarus Brewing Company, New Glarus, WI. O-34. Optimization of manufacturing conditions in canning lines by using a 3D simulation technique. Presenter: Hiroaki Tamura, Asahi Breweries, Ltd., Ibaraki, Japan. Coauthor(s): Kimiaki Yamashita, Asahi Breweries, Ltd., Ibaraki, Japan; Kouhei Yuge and Takashi Kitazumi, Seikei University, Tokyo, Japan. P-35. EquiTherm energy recovery system additional energy-saving potential in a state-of-the-art brewhouse. Presenter: Alexander Lenz, Krones AG, Werk Steinecker, Freising, Germany. P-36. Software in brewing: When it's time to build your own software (and when it's not). Presenter: Mike White, White Labs Inc., San Diego, CA. P-37. Wood aging of specialty products. P-38. Wort stripping: An innovative system for the controlled reduction of unwanted aromatics featuring optimized trickle-film formation and stripping gas utilization. Presenter: Roland Feilner, Krones Ag, Germany. P-39. A CIP procedure using the addition of hydrogen peroxide that is particularly effective under low solution flow conditions. Presenter: George Agius, Diversey Inc., Canada. 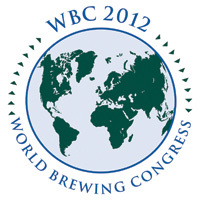 Coauthor(s): Jonathan Crawshaw, Sleeman Brewing Company, Guelph, Canada; Bart Schuurman-Hess, Diversey Inc., Canada. P-40. "Always optical" modern oxygen management in breweries. Presenter: Arjen Van Zeijst, Norit Haffmans, Venlo, The Netherlands. P-41. BRITESORB TR: Colloidal stabilization of beer using combined removal of tannoids and haze protein. Presenter: Kenneth Berg, PQ Corporation, Conshohocken, PA.
P-42. The analysis of green-beer off-flavors using liquid-liquid extraction and GC-MS.
Presenter: Acacia Baldner, Standing Stone Brewing Company, Ashland, OR. Coauthor(s): Larry Chase, Standing Stone Brewing Company, Ashland, OR; Steven Petrovic, Southern Oregon University, Ashland, OR. P-43. The use of micro-oxygenation of beer to simulate oak barrel maturation. Presenter: John Stewart, New Holland Brewing Company, Holland, MI. Coauthor(s): Molly Browning, New Holland Brewing Company, Holland, MI. Presenter: Yves-Yannick Ford, Barth Innovations Ltd., Paddock Wood, Kent, United Kingdom. Coauthor(s): Keith Westwood, Barth Innovations Ltd., Paddock Wood, Kent, United Kingdom; Andreas Gahr, Hopfenveredlung St. Johann GmbH & Co. KG, Train-St. Johann, Germany; Agnieszka Rajca Ferreira, formerly at Botanix Ltd., Paddock Wood, Kent, United Kingdom; Katarzyna Wolinska, Barth Innovations Ltd., Paddock Wood, Kent, United Kingdom; Mita Lad, University of Nottingham, Nottingham, United Kingdom. P-45. Comparison of utilization of different hop products using a newly developed hop yield enhancer. Presenter: Christina Schönberger, Barth Haas Group. Coauthor(s): Marcus Hertel, Hertel GmbH. P-46. Improvement of the taste of low alcohol beers (<1.2% ABV) especially by applying aroma hops. Presenter: Andreas Gahr, Hopfenveredlung St. Johann GmbH & Co. KG, St. Johann, Germany. Coauthor(s): Adrian Foster, HVG Hopfenverwertungsgenossenschaft e.G., Wolnzach, Germany. P-47. Analysis of historic varieties of malting barley. Presenter: Keith Thomas, University of Sunderland, Sunderland, United Kingdom. Coauthor(s): Amal Muhammed, University of Sunderland, Sunderland, United Kingdom; Christopher Ridout, Norwich Research Park, United Kingdom; Mitchell Andrews, Lincoln University, Christchurch, New Zealand; Noel Carter, University of Sunderland, Sunderland, United Kingdom. P-48. CDC Meredith, CDC Reserve, and CDC Kindersley—Newest Crop Development Centre, University of Saskatchewan two-row malting barley varieties. Presenter: Brian Rossnagel, University of Saskatchewan, Saskatoon, SK, Canada. Coauthor(s): Aaron Beattie, Tom Zatorski, and Graham Scoles, University of Saskatchewan, Saskatoon, SK, Canada. Presenter: Karen Hertsgaard, Institute of Barley and Malt Sciences, NDSU, Fargo, ND. P-50. History of barley production in the USA. Presenter: Paul Schwarz, NDSU Plant Sciences, Fargo, ND. Coauthor(s): Richard Horsley, NDSU Plant Sciences, Fargo, ND; Scott Heisel, American Malting Barley Association, Milwaukee, WI. P-51. Identification of barley varieties by lab-on-a-chip capillary electrophoresis. Presenter: Martina Gastl, Technische Universität München, Lehrstuhl für Brau- und Getränketechnologie, Freising, Germany. Coauthor(s): Elisabeth Steiner and Thomas Becker, Technische Universität München, Lehrstuhl für Brau- und Getränketechnologie, Freising, Germany. P-52. Screening of barley and malt in terms of Fusarium contamination, malt quality, and mycotoxins. Presenter: Martina Gastl, Technische Universität München, Lehrstuhl für Brau- und Getränketechnologie, Freising, Germany. Coauthor(s): Michael Hess, Technische Universität München, Lehrstuhl für Phytophatologie, Freising, Germany; Thomas Becker, Technische Universität München, Lehrstuhl füür Brau- und Getränketechnologie, Freising, Germany; Michael Rychlik, Technische Universität München, Zentralinstitut für Ernährungs- und Lebensmittelwissenschaft, Abteilung Bioanalytik Weihenstephan, Freising, Germany. P-53. The road to hulless malting barley varieties at the Crop Development Centre, University of Saskatchewan—From CDC McGwire to CDC ExPlus and HB08304. Presenter: Brian Rossnagel, University of Saskatchewan, Saskatoon, SK, Canada. Coauthor(s): Aaron Beattie and Tom Zatorski, University of Saskatchewan, Saskatoon, SK, Canada; M. J. Edney, Canadian Grain Commission, Winnipeg, MB, Canada; Graham Scoles, University of Saskatchewan, Saskatoon, SK, Canada. P-54. Safe and environmentally friendly method for onsite cleaning and repassivation of 304 stainless-steel pasteurizer components. Presenter: Jack Bland, MBAA District Mid-Atlantic. Coauthor(s): Rick Brundage, MBAA District New England; Tom Soukup, MBAA District Mid-Atlantic; Scott Pavlich, Kevin Emery, and Dave Duff. P-56. Using unfermentable sugars during fermentation to improve the palate-fullness, flavor, and oxidative stability of beer. Presenter: Thomas Kunz, Berlin Institute of Technology, Department of Biotechnology, Chair of Brewing Sciences, Berlin, Germany. Coauthor(s): Eon-Jeong Lee, Christof Reinhardt, and Frank-Jürgen Methner, Berlin Institute of Technology, Department of Biotechnology, Chair of Brewing Sciences, Berlin, Germany. P-57. Conserving energy while evaporating CO2—A review of the different technologies. Presenter: Heiko Grimm, Norit Haffmans, Rockford, IL. P-58. CIP water management using fluorescence-based technology. Presenter: David Workman, Nalco Company, Naperville, IL. Coauthor(s): Thomas Lindley and Brian Ornay, Nalco Company, Naperville, IL. P-59. Optimizing energy management of industrial process steam via on-demand steam systems. Presenter: Jason Smith, Miura North America, Inc..
P-60. Reducing carbon dioxide (CO2) usage through the use of acid and detergent cleaning of bright tanks. Presenter: Dana Johnson, BIRKO Corporation. P-61. Unique storm water management at a brewery using a rain garden/biorentention. Presenter: Jeffrey Van Voorhis, Symbiont Science, Engineering, and Construction. P-62. Beer volatile analysis: Validation of headspace solid-phase microextraction (HS/SPME) coupled to gas chromatography-mass spectrometry. Presenter: Gustavo Charry, MillerCoor, Milwaukee, WI. Coauthor(s): Maritza DeJesus-Echevarria and Fernando Perez, University of Puerto Rico-Mayaguez Campus, Mayaguez, Puerto Rico. P-64. Monitoring the rate of oxygen uptake for the control of yeast performance, fermentation, and quality of beer. Presenter: Koji Nakazawa, Asahi Breweries, Ltd., Moriya, Japan. Coauthor(s): Yuichi Nakamura, Asahi Breweries, Ltd., Osaka, Japan. P-65. Optimized fermentation and maturation with ECO-FERM™. Presenter: Rudolf Michel, GEA Brewery Systems, Kitzingen, Germany. Coauthor(s): Kristina Boee, GEA Brewery Systems, Kitzingen, Germany; Udo Funk, GEA Process Engineering Inc., Hudson, WI. MBAA President Rob McCaig kicks off the first day by taking a look at the challenges to barley, and he brings together the experts to have a full-blown discussion! Join the conversation as panelists examine topics, including barley crop status from the United States and across the globe, supply strategies to address the current crises, and brewing strategies to address a changing supply. What better way to get your mind ready for a full day of learning! 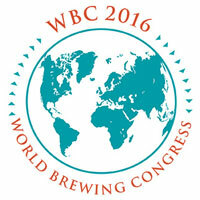 This workshop will focus on the practical method of high-gravity brewing. The reasons a brewer may choose to begin high-gravity brewing need to balance with the risks involved. Discover the "ins and outs" of high-gravity brewing and what a brewer needs to be mindful of on this quest. Topics to be discussed include the effect on raw material usage (especially yeast) during high-gravity brewing, mass balance of energy usage of high-gravity brewing vs. brewing to spec, and practical issues of high-gravity brewing. 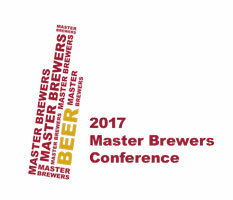 Moderators: John Haggerty, New Holland Brewing Co.; Susan Welch, Malteurop North America, Inc. Explore the intricacies of making an Old World pilsen with American raw materials. This will be a moderated panel discussion and interactive dialogue with the audience. Please bring your questions! Moderators: Vince Coonce, MillerCoors; Susan Welch, Malteurop North America, Inc.